After school is a crazy time of day for my family. Everyone soars in the door starving and ready to tell me all about their day. Instead of grabbing a prepackaged snack, I like to take advantage of their hunger (and readiness to share!) by whipping up a hearty snack that gets in lots of healthy veggies plus a complete serving of protein. The best part about a snack like loaded nachos? 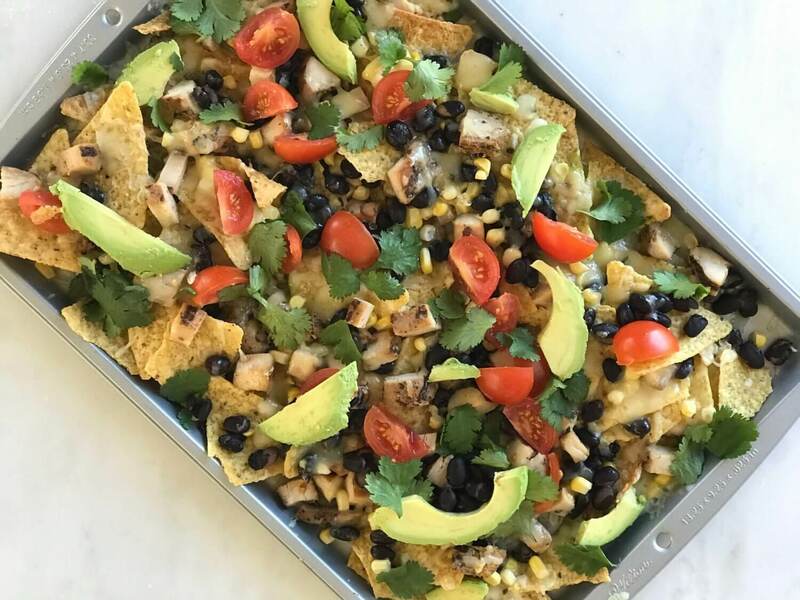 I used precooked chicken and pop the nachos under the broiler, so that this snack comes together in less than ten minutes. Little kids or work from home? 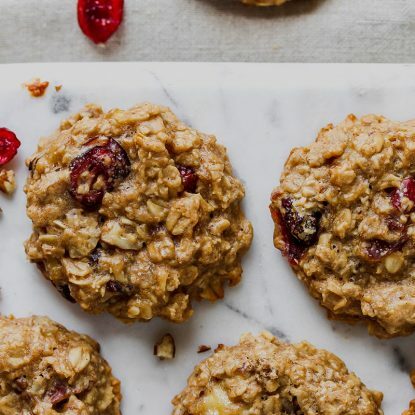 Make these for a filling lunch. We also love to load up a tray of chips, cheese, chicken, beans and veggies for a speedy dinner. 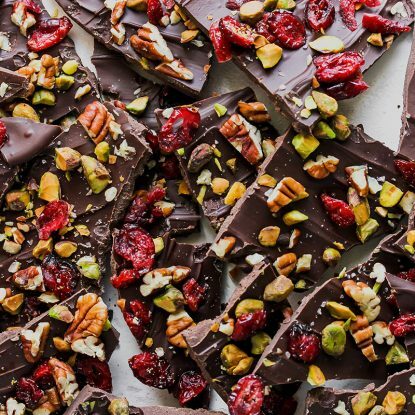 This recipe is a win-win for all! 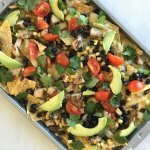 Sheetpan Chicken Nachos are a clever snacking solution for my Tex-Mex loving family. Here are a few tips to get them on the table fast! Make cleanup easy by lining your baking tray with foil. Then when snack ends, you can toss the foil, put the sheetpan back in the cabinet, and move on with your day. Prep your veggies ahead of time. When you make tonight’s salad, go ahead and chop extra tomatoes, avocado, corn, and cilantro. If you like, go ahead and mix it together, minus the avocado, for easy storage and spreading. Slice or chop chicken the night before. My secret to getting enough lean protein is always having a source handy! Having precut, cooked chicken handy means I’m more likely to add it to my salads at lunch or my nachos for a snack. Don’t sweat it if your kids snack during prep. If you see tiny hands snagging tomatoes to nosh on while they wait, that’s a win! Tailor the spice. Have kids that love a kick? Add a little salsa when the nachos come out of the oven. 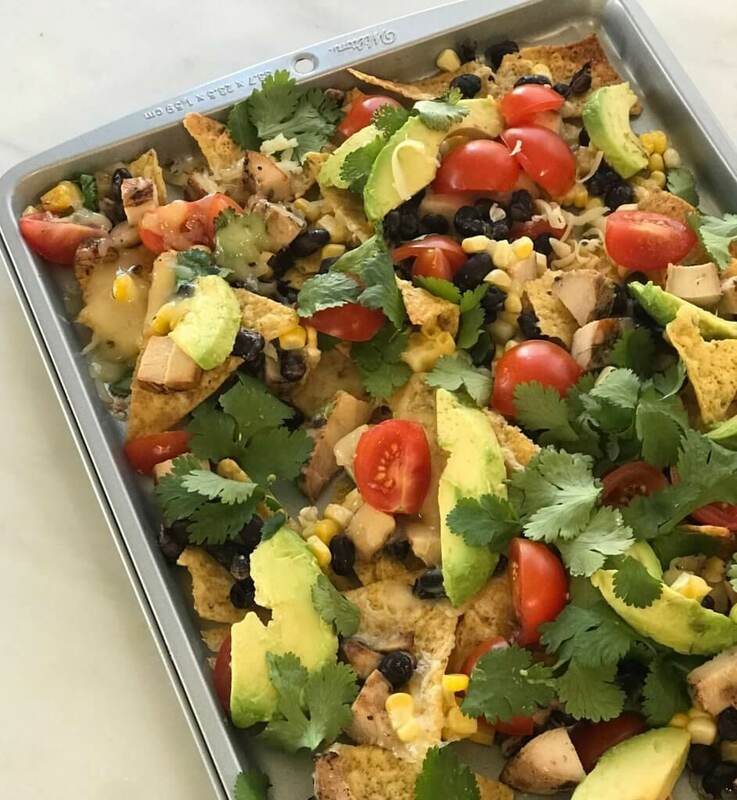 Sheetpan Chicken Nachos are a great way to add a healthy hit of dairy, protein, and fresh veggies to your day, plus serving up a hot snack makes me feel like Super Mom! 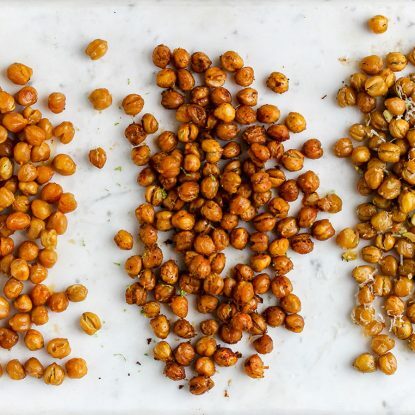 What are some speedy recipes your family enjoys for a snack or light meal? Want more nacho ideas? My No-Cook Greek Nachos are a delicious lunch while these Banana Split Nachos and Sweet and Savory Pear Nachos are definitely a family favorite dessert! Spread tortilla chips evenly on a sheetpan. Top with chopped chicken, black beans, corn kernels and cheese. Note: Recipe can easily be doubled. Top with tomatoes, avocado and cilantro. Serve immediately.